These are interesting times for suppliers in the narrowband two-way radio market. Their traditional customers are increasingly looking to see how they can access the multitude of data applications readily available to consumers via cellular broadband and Wi-Fi networks. How do they enable this while still providing all the benefits that private two-way radio networks provide? Ross Spearman, the new chief technology officer of professional mobile radio (PMR) vendor Tait Communications, certainly has a view on this as he has spent much of his professional life with Ericsson, the largest supplier of cellular infrastructure to the mobile phone industry. Speaking to Wireless earlier this year, he observed: ‘What was interesting for me coming from a 3G and 4G cellular communications background was that I came into the PMR world with a “why not just use LTE for everything” mindset. ‘But the more you learn about PMR the more you realise that these two things are quite orthogonal. PMR has huge coverage, very high reliability and very low capacity, and the other is exactly the opposite, smaller cells, high capacity and let’s say consumer grade reliability. What is obvious to me is that if you put the two together you would have a really good network,’ says Spearman. He adds that he has heard a lot of ‘either/or’ discussions when it comes to the two technologies, but to him this does not seem to be a sensible argument. ‘It would be better to use a combination of both,’ he asserts, pointing to the example of a New Zealand utility Tait is working with that has deployed both Digital Mobile Radio (DMR) and LTE base stations to both augment coverage and to be able to run data applications. ‘At Tait we have the UnifyVoice solution,’ points out Spearman. UnifyVoice integrates push-to-talk over broadband cellular (and Wi-Fi) with Tait narrowband PMR systems. This has now been extended to vehicles with UnifyVehicle. ‘The solution enables radio users to extend coverage outside of PMR range, and allows those without radios to communicate with PMR users, and that seems to me to be exactly how it should work,’ says Spearman. Judd Cain, regional manager EMEA at Tait, adds: We have customers in all the different verticals we support who already use cellular mobility and PMR today and have been for a while. They are using smartphones, maybe with some applications on top, or they are using them to make calls in areas where they do not have PMR coverage, such as at the bottom of the car park or shopping mall. Spearman observes: ‘The key thing here is that communications shouldn’t be limited to just PMR and cellular. The main thing is getting access to whatever connectivity is available in the background. The user shouldn’t need to know what the bearer is; they should just be able to push the button. Tait’s aim is to evolve the solution to the point where when the user pushes the PTT button, the intelligent UnifyVoice software automatically detects the best available network and connects the user by pairing a smart device with a radio, so users can move between radio, cellular and Wi-Fi. When the PTT button is pushed, the intelligent UnifyVoice software will automatically detect the best available network and connect to it. He adds that there are several different ways of automatically selecting the best bearer network depending on whose infrastructure, network and radios are involved. ‘You can either do it at the start of the call by looking at the signal strength, quality and so on. Or you can look at a pre-set policy and decide which way to go. ‘Or with our seamless solution we can send streams over both the PMR and LTE networks in parallel. As both streams come back into our PMR network we can then choose which has the best quality. We can do that on a 20 millisecond basis and switch between the two streams such that the network changeover is completely seamless to the end user,’ explains Spearman. Jamie Bishop, EMEA marketing manager at Tait, adds that there is a cost discussion to be factored in here too where for economic and mission critical reasons you might use one bearer or another at different time and for different applications. You might want to keep mission critical transmissions on PMR and push less mission critical traffic off to cellular, for example. But police now have two devices – a smartphone and a two-way radio. The question is how the radio with its big battery pack and 5W output can best be integrated with the smartphone. Perhaps all that is required is a PTT lapel mic with UnifyVoice capability, which could be the interface for everything – not just the radio. Spearman suggests that applications like voice recognition for things like status reports could cut out the need for bringing in dispatchers, although it will still need a connection to the network. ‘You could embed a very small set of phrases into the microphone, like “I want to run a numberplate check”, and the application would convert the speech to text then transmit that over the LTE or LMR network. The requisite data base takes the request, sorts it out, and sends back an answer either as text or speech without the need to involve a dispatcher,’ he says. This kind of technology is also important in the M2M space, which uses this kind of messaging. Tait has developed its GridLink solution for distribution automation in SCADA systems for use by utilities in particular. 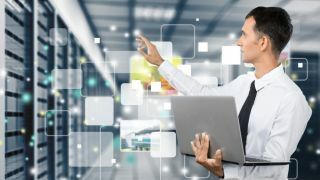 Many IoT applications are connected to equipment with 25 to 50-year lifecycles, so the IoT devices monitoring that equipment must have a long life too. Bishop says: ‘A lot of companies and utilities of different types have invested in cellular technology, 2G GPRS in particular, but in some countries mobile operators are turning off their 2G networks and are refarming the spectrum. ‘So, the end users that have relied on those 2G networks are trying to re-align themselves. What they want is security of supply for a long time and a lot of the devices they have installed have only been out there for five years, so having to replace them all with a different connectivity IoT device is way out of whack for what they need. ‘The last thing they want is to have to replace all their wireless devices out in the field every five-year regulatory period. The other key driver for utilities and power companies is to reduce the outage penalties. By meeting the outage restoration targets they can save millions by just investing in a few thousand IoT devices,’ says Bishop. To Spearman what this means is that Tait is not in the DMR and P25 radio business; rather it is in the critical communications business. ‘It is not about building radios, it is about providing a solution. We are the glue between the networks. Cain adds that the closer Tait is to its end users the better it is for them and the company’s resellers. The point being that Tait has the expertise and critical communications know-how from working closely with those end users for years. Mobile operators and some of their key vendors lack this knowledge and this is where the likes of Tait can help. Spearman acknowledges that the company must continue to evolve its hardware to make sure it is state-of-the-art and up to date, but more and more it is the software capabilities in the radios and interfaces into back office systems that will differentiate it. ‘I took a look internally when I arrived at Tait and the majority of our R&D spend is on software development, so adapting to this new world is not such a change as you might think for a PMR vendor. The difference is that we are writing code that end users interact with. It may only have been a couple of lines on a radio display before, but now we are writing code for smartphones that makes the apps work. In the past, the likes of Tait were dominated by radio engineers, but that is changing over time. Spearman points out that his future technology team uses a lot of interns who come in with completely different ideas about how things should work and with very different expectations. How about the sales channel and the resellers: are they keeping up with this change? Cain says the company has to strike a careful balance, as a lot of Tait’s customers are not looking to jump straight into the next technological innovation all the time.